Vasundhara Raje said it was the result of developmental politics which was taking India to new heights and pushing development in the country like never before. 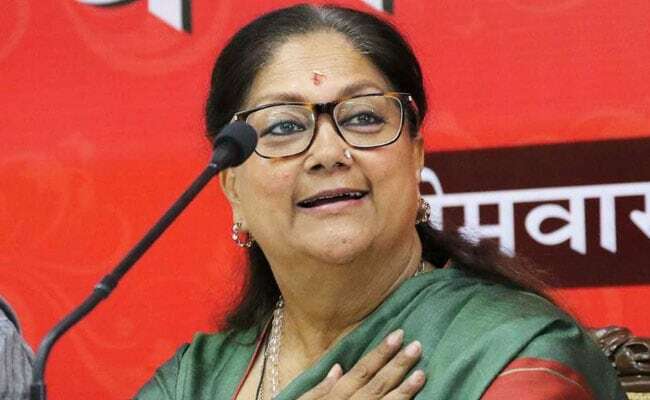 Jaipur: Elated at the BJP's performance in the assembly elections in the northeast, Chief Minister Vasundhara Raje today exuded confidence that the party would retain power in next year's assembly polls in Rajasthan. "BJP's victory in Tripura is the victory of the able leadership of the prime minister and organisation skills of the party president. Our reach has expanded and the historic win has proved that there is no alternative to the BJP in the country," Ms Raje said at a press conference in Jaipur. The journey from zero to top in Tripura was not easy and party workers had to make sacrifices there, she said, adding that the political picture of the northeast had completely changed. The vote share of the BJP in Tripura has risen from 1.3 per cent to 43 per cent, the chief minister said. Collective vote share of the BJP and its allies had risen to 51 per cent while the vote share of the Congress there shrunk to 1.8 per cent, she added. Ms Raje said it was the result of developmental politics which was taking India to new heights and pushing development in the country like never before.